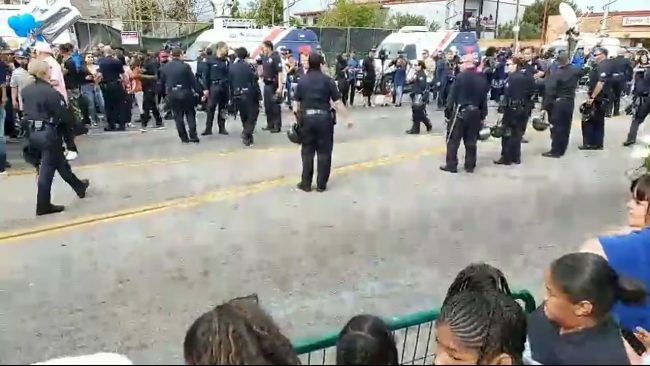 On April 11, 2019, four people were shot, and one person died in South Los Angeles, after a funeral procession to honor Nipsey Hussle went through the area. Mourners gathered from around the United Stated including faraway places such as Minnesota and Maryland. The Los Angeles Times reports the shooting occurred at 6:25 pm PT close to the intersection of 103rd and Main Street. The victims were between 30 and 50 years of age. Michel Moore, Los Angeles Police Chief, tweeted on Twitter that the suspect fired at the individuals from a gray Hyundai. The suspect left the crime scene in the same car. One person died from their injuries, and it is unknown the injuries or the conditions of the other victims. Tens of thousands of people participated in the funeral procession for Hussle. There are no indications that the shooting is in connection with the procession, and there were no further violent incidents from the Hussle procession itself.